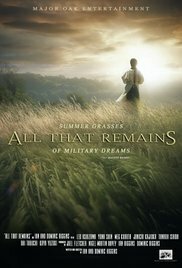 The evocative title of this film could will refer to the August 8th, 1945, bombing of Nagasaki, the second atomic bomb, after Hiroshima on August 6th, dropped on a Japanese city.After the bombing and the almost annihilation of the city and so many of its inhabitants, what remains? In the "Atomic=c-bomb rescue and relieve report" of October 1945 he has stated: "Everything was finished. Our mother land was defeated. Our university had collapsed and classrooms were reduced to ashes. We, one by one, were wounded and fell. The houses we lived in were burned down, the clothes we wore were blown up, and our families were either dead or injured. What are we going to say? We only wish to repeat this tragedy with the human race. We should use the principle of the atomic atom (sic). Go forward in the research of atomic energy contributing to the progress of civilization. A misfortune will be then transformed to a good fortune. The world civilization will change with the utilization of atomic energy. If a new and fortunate world can be made, the souls of so many victims will rest in peace." 1. The story of Takashi Nagai? The target audience? Japanese audience? Catholics, Christians? World audiences? 2. Audience knowledge of Nagai? The film opening up his life, his career, his impact? 3. The filmmaking, the British directors, the Catholic perspective, the Japanese connection, the performers? The aim of the directors in communicating this story? 4. The significance of the technical style, the realism, the surreal aspects, impressionistic? Special effects? The blend of the real and the surreal? The importance of the visuals especially for the long sequence of the dropping of the atomic bomb? The musical score, the range of songs, different styles of accompaniment, the effect? 5. The three parts, the different styles? The ultimate impact? 6. The introduction to Takashi Nagai, in himself, his age, his family, the 1930s, his study, medical interests, due to? His friends, associates at the University? The Catholic experience, Christmas, Silent Night? The church? Religion in Japan? The place of Catholicism? The priest, his words and encouragement? The reception of Nagai? 7. In himself, over the years, a good man, his marriage, love for his wife, the children, their growth? 8. The experience of the Sino- Japanese war? 9. The importance of studies, his associates, the University, atomic research, nuclear research? The parallels in the United States? The 1930s and 1940s, atomic developments, the possibilities for progress, for destruction? 10. World War II, his staying in Japan, the military stances, the leaders? The United States, the bombing of Pearl Harbor? The development of the war, moving the family to the country, the effect of the war? His continuing his work? 11. The atomic bomb? Hiroshima? August 8th, 1945? Nagasaki? An ordinary day, the Americans, the planes, the dropping of the bomb? The American perspective? The long sequence, the visuals, audience sharing the experience of the inhabitants of Nagasaki, fire and burning, instant annihilation, the variety of circumstances for people? His family? 12. The effect on Takashi Nagai, his injuries, his family and death, the associates, medical, his illness, the slow recuperation? 13. The Americans, the Japanese, the end of the war, the Emperor? The repercussions? 14. Nagai’s personal journey, the experience of deaths, the bomb, the telling of the stories, his writing and its effect, the publication, the wider audience, his sense of responsibility, his being a delegate for peace, the impact? 15. The film’s presentation of his holiness? The move towards sainthood? Heroism? Another perspective on 20th-century possibilities for sainthood?